TSE entrepreneurial students in action! Yleinen • Kommentit pois päältä artikkelissa TSE entrepreneurial students in action! Some of you may have noticed unusual or even strange things happening in the Turku School of Economics during last week (week 4). You may have encountered students interviewing peers on Entrepreneurial university, weird tickets hanging on the car windows, new Entrepreneurial University advertisements in the Mercatori screen, and new pictures in social media to name but few. 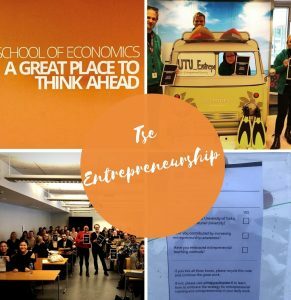 None of these were ‘official’ University of Turku or Entrepreneurial University activities but entrepreneurial activities, indeed, created by TSE students of our Corporate Entrepreneurship course. During this course students are promised to learn what entrepreneurial behavior and corporate entrepreneurship mean and how they can be developed at individual and organisational level. We have also promised that students can experiment entrepreneurial behavior; i.e. questioning the existing practices and challenging one’s boundaries, during the course. One way to experiment entrepreneurial behavior was a team challenge: to make entrepreneurship and particularly entrepreneurial university visible among students and/or faculty members. Importantly, the students only had a couple of days to create the activity. They were guided not to break laws, to remember good manners and not to disturb other classes at work but otherwise it was up to them to innovate entrepreneurial ways to raise awareness of entrepreneurial university. 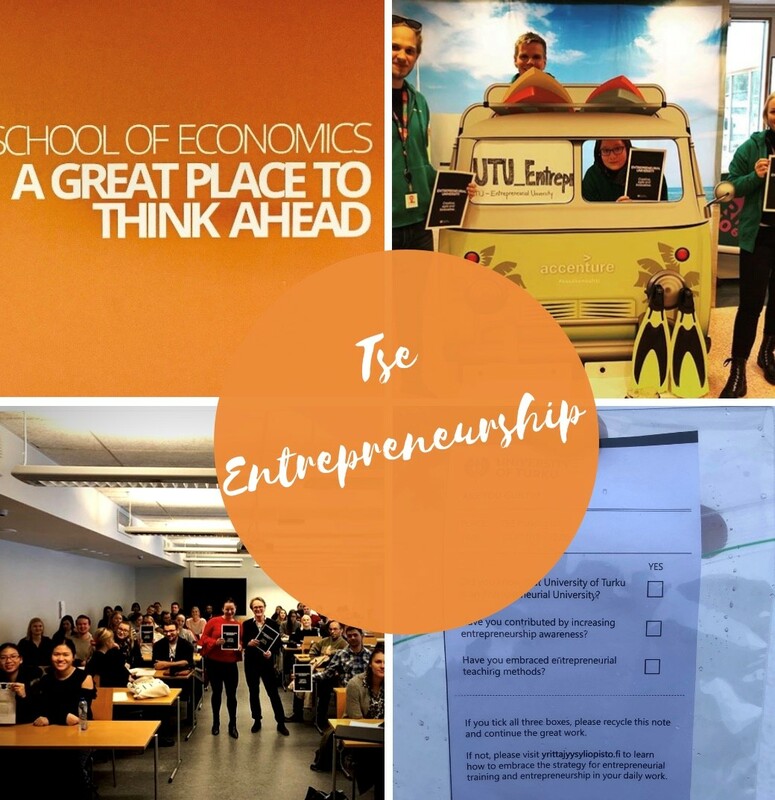 The aim was through this task to allow our students to use and strengthen their entrepreneurial capacity by doing something differently to make an impact with a very short notice. The learning experience will be evaluated by the students themselves and us based on how entrepreneurial the idea was, how entrepreneurially they executed it, and finally how well they managed to engage with the target group and create awareness. We noticed many of the activities on site, and will further hear students’ pitches about their learning experience when wrapping up the exercise. In addition, we will also together with the students select and award the winning team of the team challenge! As entrepreneurship teachers, we believe that it is important to allow the students to learn and experience entrepreneurship by themselves rather than us preaching about it. This means that we needed to trust on the process and just to let go ‘teaching’ and detailed instructions of the team challenge. We applied ‘flipped class room’ in supporting the students’ learning process and remained waiting for what happens – and secretly feared that nothing happens at all. But luckily that was not the case, but many things happened! The teams have generated new ideas, executed them more or less entrepreneurially and reflected upon their learning. In addition, we will receive about ten inspiring ideas on how to raise entrepreneurship awareness in the university. Furthermore, other students or staff members may have learnt something new on entrepreneurial behavior and entrepreneurial unviersity. It seems that not only our students have stretched their comfort zones and boundaries, but their actions have challenged others, too. We sincerely hope that their entrepreneurial actions have been taken positively as we are here to create inspiring learning experiences and support their creativity. We do apologize if any entrepreneurial student activity has somehow offended someone – it has not been the purpose. However when launching the task, we acknowledged that the students may come up with ideas which will raise critical discussion. On the other hand, we also realized, that if no such discussion takes place, the students have not performed truly entrepreneurially and the ultimate goal of making an impact was not reached. We are still looking forward to our wrap-up session and students’ pitches. However, we can already now tell how amazed and proud we are of our students’ entrepreneurial capability to get started instantly and create something innovative and visible in such a short notice. Students, indeed, are an innovative resource for the TSE. We can also feel the exciting spirit in the class room and it really inspires us. Our students’ entrepreneurial spark also challenges us – are we entrepreneurial enough as teachers and faculty members? » Yleinen » TSE entrepreneurial students in action!